Fashion designer Sophie Hardeman presented "Where the Grass is Greener"
This season Sophie Hardeman goes up to the country. The denim based collection takes inspiration from classic ranch style workwear. The handy man is the muse, along with sunkissed kids kicking round in the hay, dreaming of the other side. Using conventional wardrobe pieces as a trademark, the Amsterdam – based denim brand, dismantles recognizable day to day garments like jeans and button down shirts. By deconstructing, the common becomes reformulated. Through the fluid approach in casting, age and gender, proportions are defied at any scale. Hereby Hardeman presents a liberated outtake on the common by approaching diversity in its most authentic way. The Footwear is created in collaboration with the genderless shoe brand PETERSON + STOOP. Sophie Hardeman is a designer and the creator of the brand “Hardeman”. 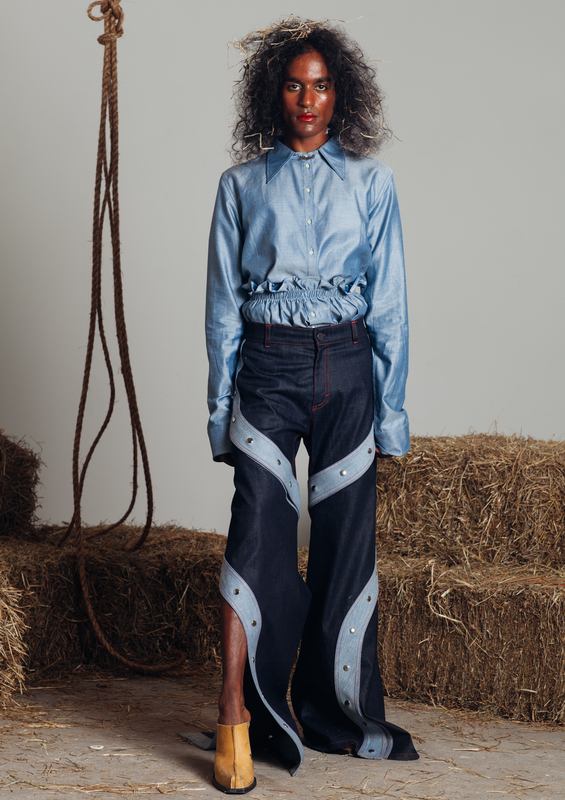 She reuses denim and jeans to create a new abnormal standard out of the conventional denim look. She previously studied at the Gerrit Rietveld Acadamie.